DD Form 2781 - also known as the "Container Packing Certificate Or Vehicle Packing Declaration" - is a United States Military form issued by the Department of Defense. The form - often incorrectly referred to as the DA form 2781 - was last revised on August 1, 2013. Download an up-to-date fillable PDF version of the DD 2781 below or request a copy through the chain of command. "container", as applicable. After completion, sign the certificate. a. The cargo transport unit (container/vehicle) was clean, dry, and apparently fit to receive the goods. serviceable in conformity with 7.4.6 (IMDGC). (unless approved by the competent authority concerned in accordance with 7.2.2.3 (IMDGC)). e. Drums have been stowed in an upright position, unless otherwise authorized by the competent authority. f. All packages have been properly packed onto or in the cargo transport unit (container/vehicle) and secured. g. When dangerous goods are transported in bulk packagings, the cargo has been evenly distributed. 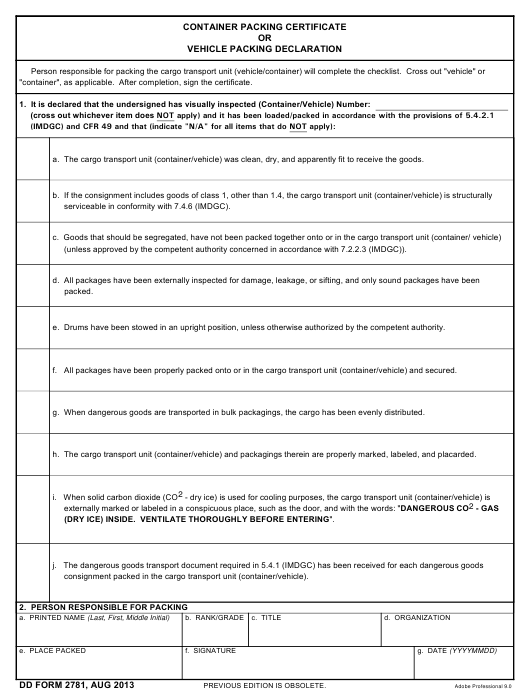 h. The cargo transport unit (container/vehicle) and packagings therein are properly marked, labeled, and placarded. (DRY ICE) INSIDE. VENTILATE THOROUGHLY BEFORE ENTERING". consignment packed in the cargo transport unit (container/vehicle).